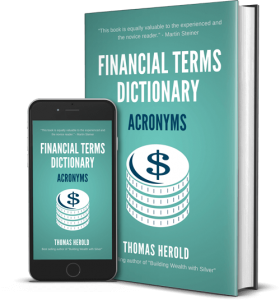 This practical financial dictionary for acronyms & abbreviations helps you understand and comprehend most common acronyms & abbreviations. It was written with an emphasis to quickly grasp the context without using jargon. Each of the acronyms is explained in detail and also gives practical examples. This book is useful if you are new to business and finance. It includes most acronyms & abbreviations for businesses, investors and entrepreneurs. It also covers the lingo that was introduced in the financial crisis of 2008 until 2017. With the alphabetical order it makes it quick and easy to find what you are looking for. Example Acronym: What is Consumer Price Index (CPI)? The Consumer Price Index, also known by its acronym of CPI, actually measures changes that take place over time in the level of the pricing of various consumer goods and services that American households buy. The Bureau of Labor Statistics in the U.S. says that the Consumer Price Index is a measurement of the over time change in the prices that urban consumers actually pay for a certain grouping of consumer goods and services. This consumer price index is not literal in the sense of what inflation really turns out to be. Instead, it is a statistical estimate that is built utilizing the costs of a basket of sample items that are supposed to be representative for the entire economy. These goods and services’ prices are ascertained from time to time. In actual practice, both sub indices such as clothing, and even sub-sub indices, such as men’s dress shirts, are calculated for varying sub-categories of services and goods. These are then taken and added together to create the total index. The different goods are assigned varying weights as shares of the total amount of the expenditures of consumers that the index covers. Two essential pieces of information are necessary to build the consumer price index. These are the weighting data and the pricing data. Weighting data comes from estimates of differing kinds of expenditure shares as a percentage of the entire expenditure that the index covers. Sample household expenditure surveys are sourced to figure what the weightings should be. Otherwise, the National Income and Product Accounts estimates of expenditures on consumption are utilized. Pricing data is gathered from a sampling of goods and services taken from a sample range of sales outlets in varying locations and at a sampling of times. The consumer price index is figured up monthly in the United States. Some other countries determine their CPI’s on a quarterly basis. The different components of the consumer price index include food, clothing, and housing, all of which are weighted averages of the sub-sub indices. The CPI index literally compares the prices of one month with the prices in the reference month. Consumer Price Index is only one of a few different pricing indices that the majority of national statistical agencies calculate. Inflation is figured up using the yearly percentage changes in the underlying consume price index. Uses of this CPI can include adjusting real values of pensions, salaries, and wages for inflation’s effects, as well as for monitoring costs, and showing alterations in actual values through deflating the monetary magnitudes. The CPI and US National Income and Product Accounts prove to be among the most carefully followed of economic indicators. Cost of living index is another measurement that is generated based on the consumer price index. It demonstrates how much consumer expenditures need to adjust to compensate for changes in prices. This details how much consumers need to keep up a constant standard of living.